You will earn 4,889 Reward Points. Earn 1 reward point for every 1 dollar spent. Single control for changing from hot to cold operation. 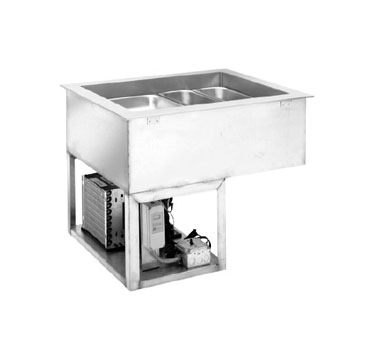 Wells Dual Temperature Hot & Refrigerated Drop-In Cold Pans are two units in one; from a heated Bain Marie to a refrigerated cold pan with the flip of a switch. All models are completely self-contained in one to six-well models are CFC free and are recessed 3” to comply with NSF-7 performance requirements. Interior – CFC free foamed-in-place insulation through-out, 1” drain located in the center for easy cleaning. Ledge is recessed 3” to comply with NSF-7 requirements, allowing a layer of air to insulate food and for pan support. Exterior – One-piece top flange and coved-corner interiors constructed of 18 gauge stainless steel. Exterior body constructed of heavy-gauge, corrosion resistant steel. Condensing unit mounted on corrosion resistant frame below the cold pan. Refrigeration – Air cooled, type 134A or 404A CFC free refrigerant systems featuring wrapped coil construction on both sides and bottom. Refrigeration system features sight glass, easy service valves, dryer/filter and receiver. Condensing unit may be easily removed for service. Larger compressors speed refrigeration.